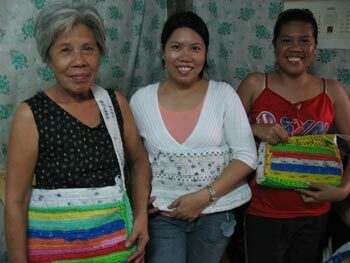 Virgie took her new skills to her mother and sister on her days off. Joined by local friends all impressed with their crocheted products and the money they earn, that group has grown to over 20+. Without a space to hold the gatherings, we crowd into rickety homes and Virgie continues to work as a domestic helper and attends to her workshops at Creek Club and Bicutan when she can. Virgie with her sister and 69-year-old Teresita, who herself has 7 kids, 22 grandchildren, no income, completed 1 year of high school. *Barangay means "village" in Filipino. All locations of these listed barangays are in Metro Manila. All images, graphics, text, design elements and all other content represented on this website are copyrighted and are the sole property of Ann Wizer unless otherwise stated. All use and/or publication rights are reserved worldwide. No images or other content on this website may be copied, stored, manipulated, published, sold or reproduced in whole or in part in any form without the prior written authorization of Ann Wizer or an authorized representative.